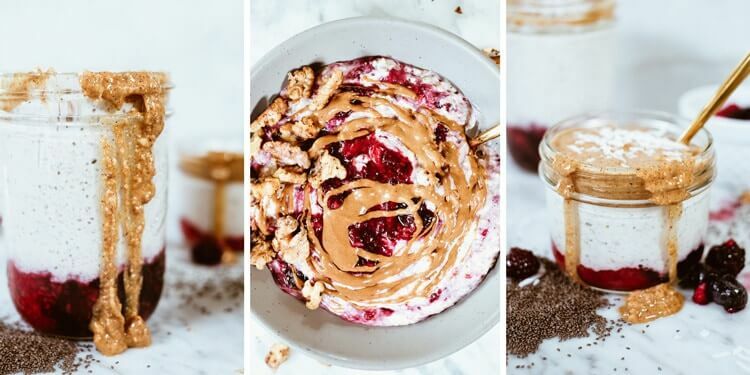 I was a little late to the overnight oats and chia pudding game, but now that I’m finally on board I looovveeee coming up with new combinations. 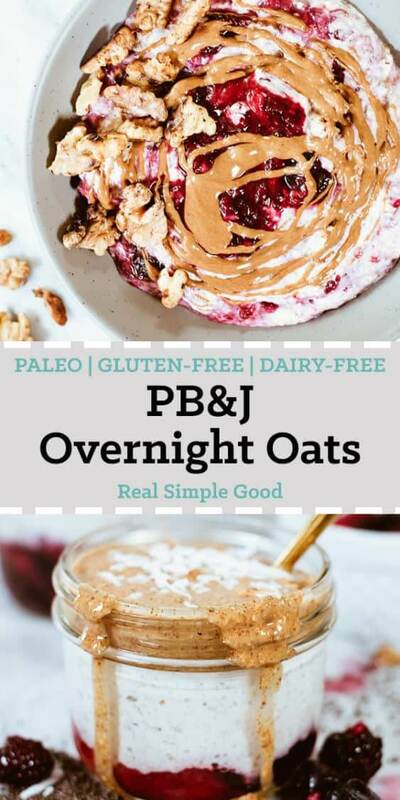 These “PB” and jelly healthy overnight oats are actually Paleo, grain-free, dairy-free and refined sugar-free. They lack nothing in flavor and texture though! And they’re super easy to throw together! I mean does it get any more classic than PB and Jelly? I think not. However, most store-bought jelly is loaded with sugar and preservatives and really just not super healthy. So, we opted for using real fruit and calling it good! 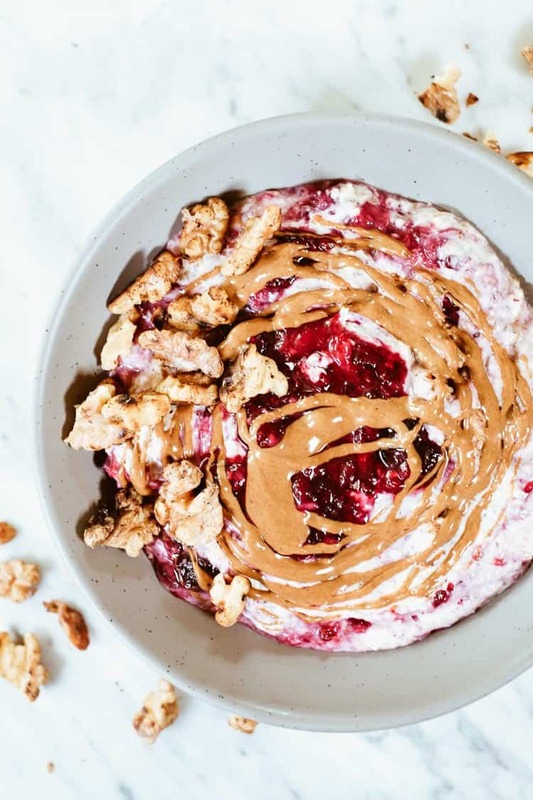 You get the fruity combo mixed with the overnight oat/chia pudding and then we top it with a clean nut butter. Look for something with no refined sugar (or even no added sugar at all) and minimal ingredients. There are so many options out there currently. I recently found a tasty hazelnut butter; almond butter is always good too. Cashew butter probably tastes the most like a traditional peanut butter to me. 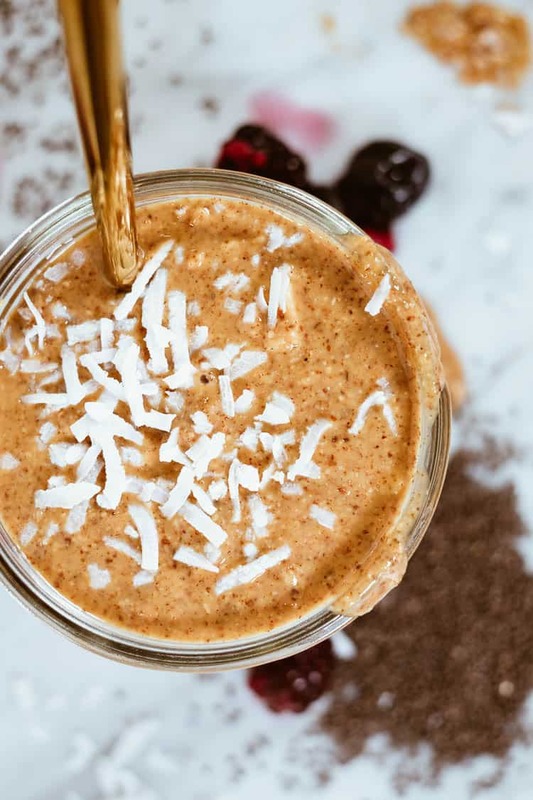 Go with the fruits and nut butter that you love! You know we are all about meal prepping and making ahead food to keep our work week easy and less stressful. 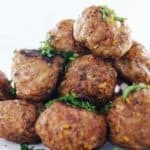 This is one of our favorite make ahead recipes. 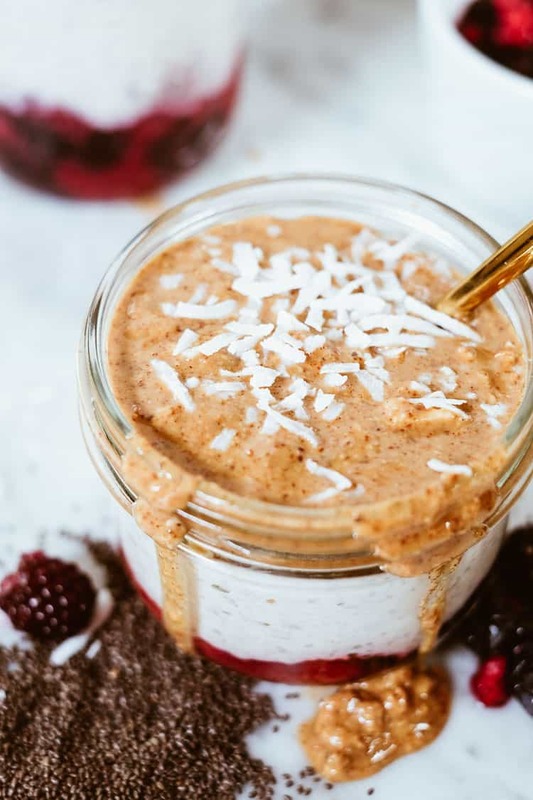 While I don’t eat a traditional breakfast like Justin, I am just as happy to have this healthy overnight oats recipe meal prepped and in the fridge because I do like a late morning or afternoon snack some days, and this is perfect for that! While Justin can eat eggs for breakfast day in and day out…I cannot. I actually haven’t really been eating eggs at all lately. And in all truth, I’m actually not much of a breakfast person. I love breakfast foods, but my body seems to need more time to digest, and if I stuff my face first thing in the morning, I kind of feel like I never really catch up throughout the day. So, I generally opt for a bulletproof coffee in the morning. 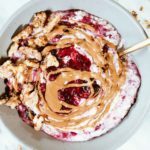 Then, these “PB” and jelly healthy overnight oats are the perfect mid-morning, post workout kind of snack/meal for me. 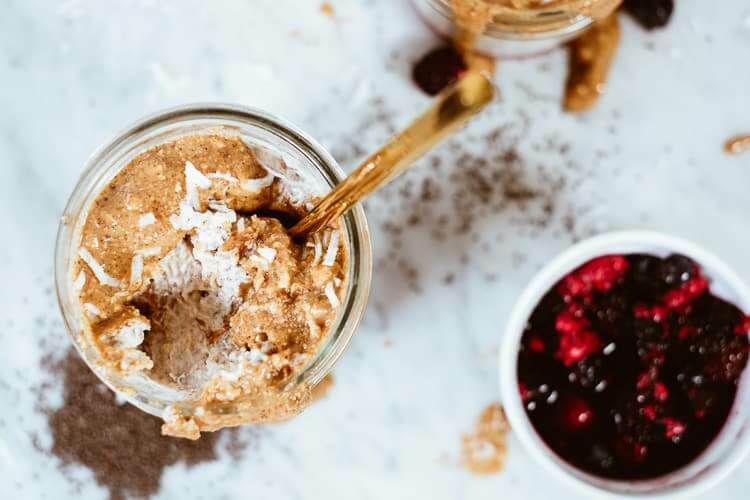 You will love this Paleo combo of grain-free overnight oats and chia pudding! Plus, who doesn’t love the classic PB&J combo, right?! 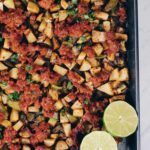 Add this to your meal prep plans this coming weekend to on hand for the following week! Let us know how it goes by leaving a comment below. Also, take a photo and tag us on Instagram @realsimplegood, so we can check it out! If you don’t already follow us on Instagram, definitely give us a follow! We appreciate every single like, comment and message we receive! Now that I'm finally on board with overnight oats and chia pudding I looovveeee coming up with new combinations. 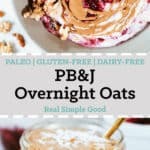 These "PB" and jelly healthy overnight oats are actually Paleo, grain-free, dairy-free and refined sugar-free. They lack nothing in flavor and texture though! And they're super easy to throw together! Portion out thawed berries into either one pint or two 6-8 ounce mason jars. Use a fork to mash the berries up a bit. I like to leave mine a little chunky though. In a food processor, pulse nuts until they are grainy. Then, transfer to a mixing bowl. Add chia seeds, ground flax, maple syrup, vanilla, sea salt and coconut milk to jar. Stir to combine everything. Pour mixture into mason jar(s). Cover and refrigerate overnight. Once set, you can serve cold or warmed up. 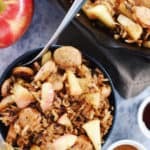 Add nut butter on top and any other toppings you'd like. Enjoy! So where do the “oats” come in? 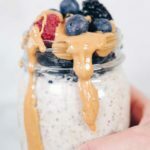 I don’t see them in the recipe, or is this suppose to be more like a chia pudding rather than oats? Wonder what this would taste like with dates instead of syrup for Whole30? 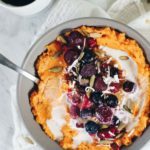 You can just omit the maple syrup entirely, no need to even replace with dates for Whole30! 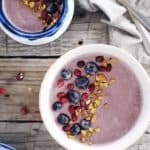 It’s better to go with less sweet on your Whole30 anyhow and there will already be some sweetness from the berries! Enjoy!